Published: Nov. 11, 2012 at 11:12 p.m. 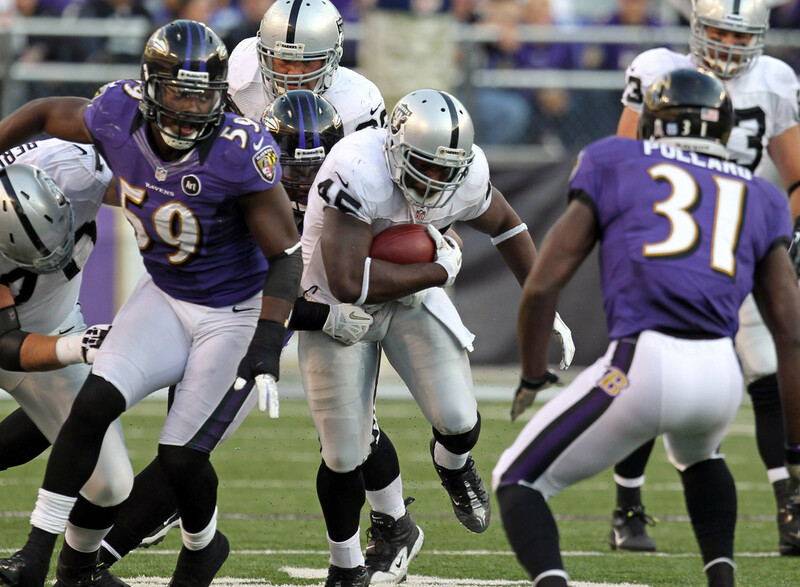 Updated: Nov. 11, 2012 at 11:18 p.m.
Reece was clearly the top running back for Oakland in Week 10, posting 20 touches, seven catches and 104 scrimmage yards in a loss to the Baltimore Ravens. Taiwan Jones put up just three touches. Until Darren McFadden or Mike Goodson returns, Reece needs to be owned in fantasy leagues moving forward. Palmer has absolutely been on fire in recent weeks, throwing for a combined 782 yards and six touchdowns in his last two games. He'll continue to be a terrific fantasy option in Week 11, as the Raiders face a New Orleans Saints defense that has been gashed by opposing offenses all season long. No, this isn't just the Raiders edition of the waiver wire. However, a matchup against the Saints makes Palmer, Reece and Heyward-Bey all valuable options. The Maryland product recorded 13.80 fantasy points against the Ravens and has now scored a touchdown in two of his last three games. Hartline has posted two straight nice stat lines, recording a combined 16 catches for 186 yards. Though he has been anything but consistent in the stat sheets, he can be a viable No. 3 option against poor pass defenses. That's exactly what Hartline faces in Week 11 against the Buffalo Bills. Shorts has been listed in this space in the past, but he's still a free agent in far too many NFL.com leagues. That should change after he posted 105 yards and one touchdown in a loss to the Indianapolis Colts. Shorts and his teammate, Laurent Robinson, are both worth a look at wide receiver. The Packers appear to be done with Alex Green in a featured role, as Starks led the team with 17 carries and 61 rushing yards against the Arizona Cardinals. Green Bay was on a bye last week, so Starks remains a free agent in most fantasy leagues. Remember, Cedric Benson can't return until Week 14. Ivory has been gang busters since Darren Sproles went down with an injured hand, posting a combined 25.50 fantasy points in two games. While trying to predict which Saints runner will see the most touches each week is difficult, Ivory has a great matchup upcoming against a porous Raiders defense. Alexander had a huge game against the Tampa Bay Buccaneers, posting 134 yards and one score for 19.40 fantasy points. Whether or not he can keep up the good numbers remains to be seen, but Alexander has quickly moved up the depth chart and is now at least worth a claim in those larger leagues. The Steelers could be without Antonio Brown (ankle) for a few games, so Sanders will step in and see a more prominent role in the offensive attack. A potential playmaker with the speed to make some noise in the vertical passing game, Sanders will have fantasy appeal while Brown is injured. The Cardinals don't have a true No. 1 running back, so Wells should re-claim the top spot on the depth chart once he's eligible to return in Week 12. While he does have tough matchups, the Ohio State product is still well worth a roster spot in most fantasy football formats right now.